1. Chocking hazard: Small parts included, adult assemble only. 2. For a better writing, the board can be cleaned regularly with a wet cloth. 3. Please read the instructions carefully before use. 4. The drawing easel is made of wood, board and holder will be affected by weather, please do not put it aside the heating system or under the sun. 5. Please do not let the children painted on the wooden frame, otherwise, the painting can not be erased. 1. Due to the different monitors, the picture may not reflect the real color strictly, please make the object as the standard color. 2. Manual measurement, product size and physical may exist 1-2cm error is normal. ?Material? : Beech. ?Size? : L 55cm*W 61cm*H 135-230cm adjustable (As shown in the picture). ?Features? : Beautiful card head, fine polishing, bottom tray, high-quality hardware. ?Wide range of uses? : Ideal for use at home, in the studio or on the field. 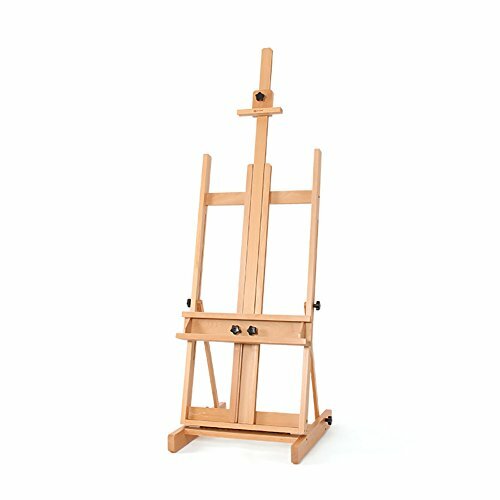 This easel is not only a great accessory for artists and painters, but also for office, presentation, school or storefronts. ?About Delivery? : Delivery time 10-15 days. Return Range 30 days.